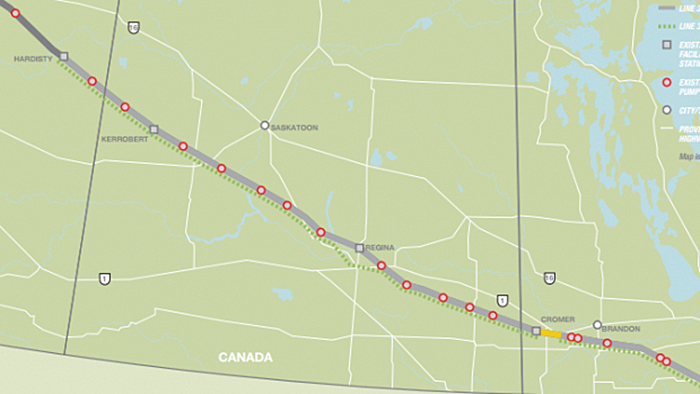 The Enbridge Line 3 route across Saskatchewan and Manitoba. A short section of Line 3 east of Cromer has been replaced already. The rest will be replaced as part of the new project. Ottawa gave the green light to Kinder Morgan’s Trans Mountain pipeline and Enbridge’s Line 3 Replacement, while it rejected the Northern Gateway Pipeline. Line 3 runs from Hardisty, Alberta, cuts across southeast Saskatchewan and southwest Manitoba, and runs to Superior, Wisconsin. Line 3 is presently operating at about half capacity after the company voluntarily reduced pressure because of reliability concerns. Enbridge says the replacement pipeline will restore the original capacity, which was 760,000 barrels of oil per day, compared to the current 360,000. In making the announcement Tuesday, Prime Minister Justin Trudeau said oil production is increasing, and current pipeline infrastructure will soon be at capacity. The Line 3 replacement project would be a significant construction project in southeast Saskatchewan and southwest Manitoba. While pipe is stockpiled at Fairlight in anticipation of the Line 3 construction going ahead, Todd Nogier of Enbridge said the Canadian approval doesn’t necessarily mean the project will go ahead immediately. Line 3 runs across the Prairies and continues into the United States. American approval is still pending and, unlike the Canadian system, is not based on a specific timeframe. “While we have received approval today for the Canadian portion of the pipeline, we still require regulatory approval for the U.S. portion,” said Nogier. “What we’re doing is aligning the construction schedules to ensure that both sides are done in a timely fashion. What timeline is the regulatory process in the U.S. on? Could the Canadian replacement move forward if the American work isn’t approved? The Line 3 expansion project would take 24 to 36 months to complete. At $7.5 billion, Enbridge’s Line 3 Replacement Program will be one of North America’s largest pipeline infrastructure programs. According to Enbridge, the program will create thousands of jobs, generate hundreds of millions of dollars in tax revenue, and contribute billions to the GDP of Canada and the United States via direct, indirect, and induced benefits. • 9,183 induced jobs in Canada and the U.S.
Labour income generated is estimated at $1.828 billion in Canada and $848 million in the U.S.
Economic modelling predicts that the project will result in estimated tax revenues worth $514 million to Canadian federal and provincial governments, and $300 million to U.S. federal and state governments during the construction phase. Four provinces and three states will directly benefit from this project. The Line 3 Replacement Program will contribute $2.873 billion of GDP generated in Canada, and a further $1.2 billion generated in the U.S. through the design and construction phases. The impact on the Saskatchewan economy is estimated at $1.065 billion, and on Manitoba is estimated at $391 million. According to Enbridge, local economies will benefit from the Line 3 Replacement Program through additional employment opportunities and spinoffs for goods and services required to support construction and ongoing operations. Enbridge says the project will also stimulate local economies through the purchase of goods and services from local retailers and suppliers of accommodation and food for workers. The other pipeline approval announced last week will take oil to the West Coast for export. Trans Mountain expansion project will nearly triple the capacity of an existing pipeline to 890,000 barrels a day. The $6.8-billion, 1,150-kilometre twinned pipeline will move a mix of oil products from Edmonton to a terminal in Burnaby, B.C., near Vancouver, where it will be exported to markets in Asia, as well as to Chevron’s Vancouver-area refinery. Many First Nations, including 39 in B.C. and Alberta, have signed “mutual benefit agreements” with the project’s proponent, U.S.-based Kinder Morgan. Those deals will deliver money and jobs to First Nations communities. The company also told CBC News in a statement that it has reached agreements with all First Nations communities where the project crosses a reserve. Kinder Morgan forecasts the expansion will create 15,000 jobs a year during construction, and a further 37,000 direct and indirect jobs for every year of operation. It also estimates expanded operations will deliver an additional $46.7 billion in government revenues for all levels of government in the first 20 years. The bulk of that money, $19.4 billion, would flow to Alberta.